Charles Lewis will travel to Oxford, England, to participate in an Oxford University Reuters Institute for the Study of Journalism roundtable about the future of investigative journalism and collaboration. “I don’t know the answers,” Richard Gingras, vice president of Google News, said at “Considering The Future Of Journalism" recently at the Newseum. And easy solutions are not in sight, he added, when he and Michael Oreskes, senior vice president of news at NPR, took the stage. But both offered ideas and made the case for stronger content. 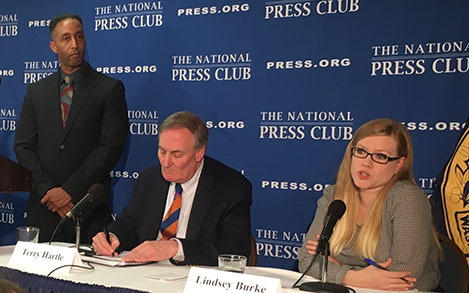 Lindsey Burke, far right, of the Heritage Foundation says the government could consider eliminating federally subsidized loan programs. Will President-elect Donald J. Trump try to repeal the Common Core? Will he make good on a campaign promise to invest $20 billion in school choice? What about reducing the cost of college? Sometimes, as both reporter and reader, news stories can feel a little repetitive. Another tragic shooting or overdose, leaving torn families in its wake. Another environmental disaster we may not be able to slow down in time. Another abuse of power, exposing biases, neglect or other shortcomings. Every student at the University of Missouri School of Journalism has to take a course in media law. Our colorful professor, Sandra Davidson, was an expert match for a curriculum filled with sarcastic holdings, absurd lawsuits over adult magazines, tongue-in-cheek advertisements and even rap lyrics (which she performed with enthusiasm). I loved it so much the first time around that I came back as a graduate teaching assistant for two more semesters. A new Pew Research Center survey finds younger adults more privacy-conscious, and older ones less aware of the control they have of their newsfeeds on Facebook. Many were aware of the Cambridge Analytica data breach. The Trump administration missed the first of two deadlines to reunite children separated from their parents. The action came after public backlash mounted, and a federal judge issued a nationwide injunction to reunite families separated at the U.S.-Mexico border within 30 days. More than 30,000 people rallied in Washington on June 30 to demand the Trump administration reunite families immediately. Newspaper circulation plummeted again last year, following the trend of decreased distribution since the early 2000s, according to a new Pew Research Center report released Wednesday. The Years of Living Dangerously climate-change series on Showtime. Hunting the Nightmare Bacteria, a co-production with FRONTLINE. The Hole: On any given day, about 300 immigrants are held in solitary confinement. BankTracker: For the vast majority of banks profits are harder to come by. Momentive: Inside a company after private equity takes over. Toxic Influence: Children exposed to toxic substances can develop learning disabilities.